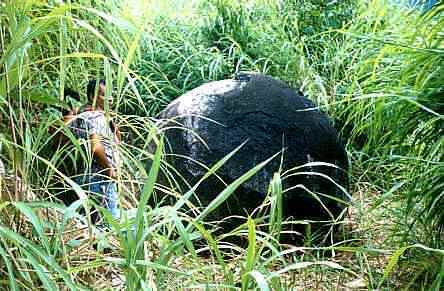 WERE COSTA RICAN SPHERES ANCIENT RECEIVERS? One of the strangest mysteries in archaeology was discovered in the Diquis Delta of Costa Rica. In the 1930s, the United Fruit Company planted huge quantities of bananas in this region. Workers clearing forests found numerous spherical stones. The balls were perfectly round and were anywhere from a few inches to over 8 feet in diameter. They were composed of solid granodiorite; a very hard igneous rock. The mysterious balls were cut, trimmed and then polished to a high luster. The spheres number over 300. The large ones weigh many tons. Today, they decorate official buildings such as the Asamblea Legislativa, hospitals and schools. You can find them in museums. You can also find them as ubiquitous status symbols adorning the homes and gardens of the rich and powerful. The Costa Rican Balls have been endangered ever since their discovery. Treasure hunters have destroyed many with the aid of dynamite. Agricultural activities have cracked and broken a number of these enigmatic balls. Banana planters have moved almost all of the balls. Presently, only 6 of these objects are known to stand in their orginal locations. The spheres have been relocated to the tops of hills and mountains as well as on islands many miles off the coast. The source of these rounded rocks are absolutely known. The quarry was the summit of the Talamanca mountain range. Unfinished spheres were never found. Like the monoliths of the Old World, the Costa Rican quarry was more than 50 miles away from the final resting place of these mysteries. In the 1940s, Samuel K. Lothrop studied these granite spheres. In his Archaeology of the Diquis Delta, Costa Rica, he suggested that the spheres were placed in 'astronomically-significant' alignments. We will never know if Mr. Lothrop's theory is true. Outside of a few exceptions, the balls were either utilized or stored at Finca 6 (Farm 6) in southern Costa Rica. Everytime such anomalies are disovered, that do not fit the traditional picture, there are always those scientists who insist these formations are natural. The Bimini Wall or Road was claimed to be natural. The unexpected, underwater, Japanese Pyramid was also supposed to be unartificial. Here too, in Costa Rica, rational-thinkers abound with ideas on how the CRBs were formed. One is 'ejecta,' from when the Talamancas were an active volcanic range, cooled as it fell to Earth. Another is moving, glacial, ice sheets crushed and pushed all that was underneath much the way we would work a ball of clay with our hands. Some have theorized that their original intent was the same as what they have become thousands of years later: lawn ornaments or symbols of power. The mysterious spheres were man-made. What you have read so far are statistics and concepts that you could find with a little research on your own. What you will read from here on are ideas that you will not find in the usual sources of information. What if the CRBs were ancient power receivers? This writer has established, in previous articles, the possible existence of a prehistoric/worldwide Tesla system used by the descendants of the Atlanteans. The ancient monoliths, pyramids, stone circles and grand statues were not just art or architecture. They were the Utility Poles of the Gods. Wireless, power distribution is the key to understanding the pyramid civilizations. All we need is a stone, (crystalline) ground contact to tune in the power. Functioning like tuning forks, the stones vibrate or relay the EM world frequency. The Costa Rican Balls are all we need, in a cityless region, to expand the World Wireless; so that communications remain intact; so that ancient aircraft remain powered, etc. The pyramids have astronomical and power-grid alignments. The ancient, stone circles have this grid pattern. The American mound-builders constructed mounds (in a pattern) around the main complex at Cahokia. In Africa, smaller Zimbabwes were built surrounding the central/stone complex. The spheres in Costa Rica could fit the pattern where their original locations truly had a significance. Remember the Olmec and their creations of (rounded) African stone-heads? In Vera Cruz, these spherical heads weighing many tons were discovered; isolated in the jungles and far from their quarry. The same purpose of relaying an EM wireless frequency could explain both the Olmec heads and the Costa Rican Balls. In the modern stone-art known as lapidary, it is very difficult to make a perfect sphere that is 2 feet wide. To manufacture spheres out of a hard substance that is 6, 7 or 8 feet in diameter...is building on a scale above what we can accomplish today. For the ancients, it was child's play. Sadly, CRBs are no longer unearthed on a regular basis like they were decades ago. New technologies such as ground penetrating radar may reveal more in the future. One last thought for those of you wondering about the wireless-energy explanation to the Costa Rican mystery.....The general shape of the top of an antenna: is a ball.